2. In a medium saucepan, combine cream and milk over medium heat until scalded (you will see small bubbles forming at the sides of the pan). Remove from heat. 3. In a bowl, whisk together egg yolks, egg substitute, sugar, and salt. Temper in some of the hot cream and stir well before stirring mixture back into the hot cream. Tempering is a technique where you add a small amount of a hot liquid to a colder liquid before combining them, which works well to prevent things like raw eggs from cooking into a solid when it is mixed into a hot liquid. 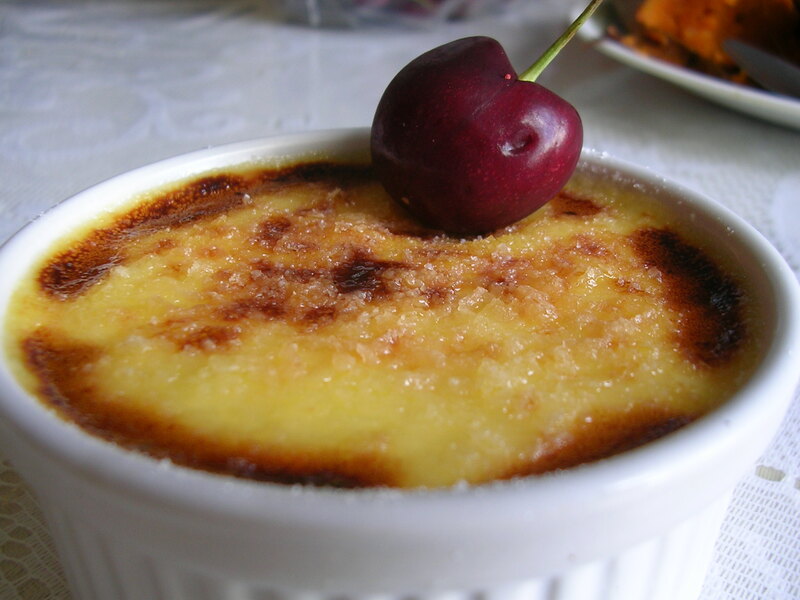 Make sure you remember to do it, because having egg lumps in your creme brulee will pretty much ruin the experience. 4. Stir in vanilla extract. If you want to use a vanilla bean instead, add it into the cream after you initially finish scalding it, to let the flavor release into the cream better. Just remember to strain it out before baking the creme brulee. 5. 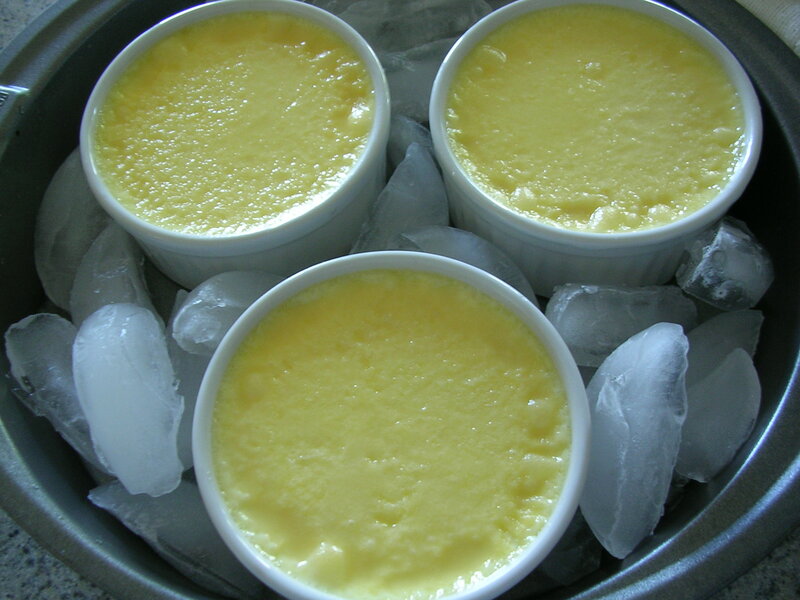 Arrange the four ramekins into a casserole dish (preferably glass, as it insulates best). Pour in boiling water using a tea kettle so that the water level reaches about 1 inch or so up the ramekins. I stopped when the water level reached the top of the outer ramekin vertical ridges. 6. Ladle in cream mixture into each ramekin until just about filled to the top. I had just enough for the 4 ramekins with maybe a few teaspoons excess. Bake at 325 for about 35 minutes or until just set. When you gently wobble the casserole dish you'll see the creme brulee tops jiggle but it will look like there is a thin film solidified on top. That's when you want to take it out! Don't worry that the tops aren't pretty and even, since you're going to caramelize sugar on top before serving it. Just don't let any hungry family members eat it in this state! Because my family did! I was so shocked when I woke up the next morning and saw an empty ramekin on the kitchen table (hence only 3 left in the picture). My parents were wondering what what heck it was and why it tasted not bad but not great either. They thought I was trying to make egg tarts or something. Creme brulee just don't taste like anything at all without the caramelized sugar top. Anyway, after you take them out of the fridge they should have firmed up, and may be a little wet on top from condensation if you put it into the fridge when it was still pretty warm. You can pat off some of that moisture carefully with a paper towel if there's too much. 8. Now to caramelize the tops! 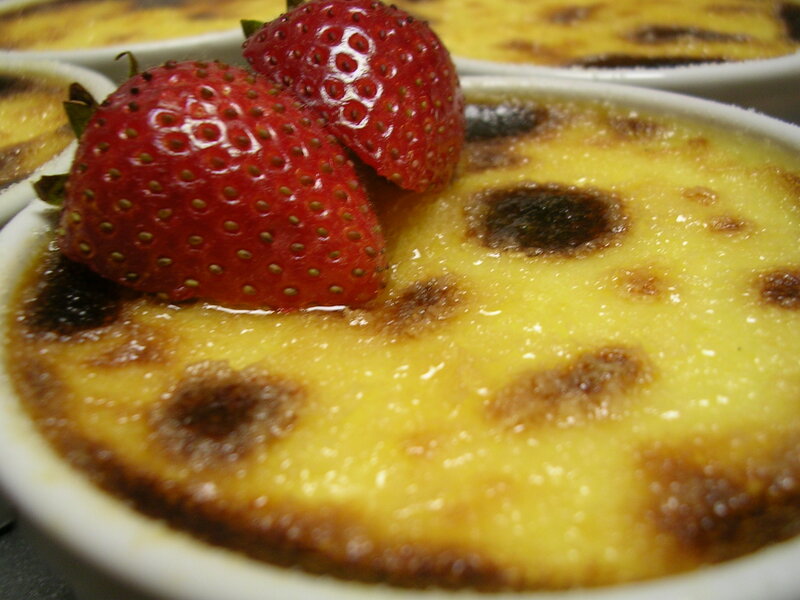 Sprinkle about 1/2 tsp of white cane sugar on top of the creme brulees, to make a thin even layer. Then you have a choice of passing over them with a blow torch until the sugar on top becomes bubbly and browned or you can simply broil them about 6" from the heating element. I don't have a blow torch, so I went the broiler route, which took a while to caramelize the sugar on top and kept burning the rims of the creme brulees (because the heat goes into the ramekin and heats up the edges of the creme brulee the fastest). So I had to stop often before the centers were brown. But still, the sugar melts pretty quickly and bubbles, which is the most important part to forming a good crust on top. 9. Remove from broiler and let cool until the tops are hardened. Serve immediately. This entry was posted on Friday, August 31st, 2007 at 5:17 am	and posted in baking, desserts, French, healthy, recipes, Uncategorized. You can follow any responses to this entry through the RSS 2.0 feed. First off-I'm happy to see you're back!! Great post here…I'll definitely have to try this out. Thanks :) I hope your creme brulee turns out yummy and definitely post your results when you get to making it!